I’m going to be bold for just a moment and assume that you spend a fair amount of time at the computer. If you pile on hour after hour in front of a screen, maybe you should take the time to make sure you’re as comfortable as you could possibly be – which is where ergonomics comes in. Ergonomics is the science of designing the job, equipment, and workplace to fit the worker. 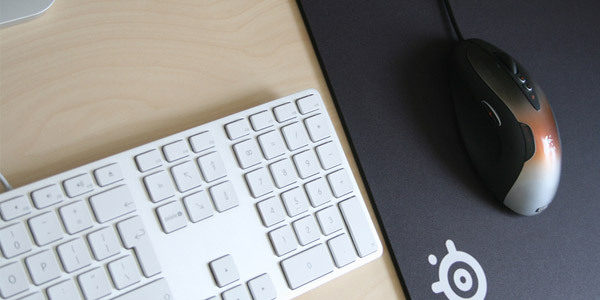 There are two reasons to have an ergonomic setup – health and productivity. With that said, why not see what you can do to tweak your work environment and consequently live a longer and more productive life? There are plenty of articles floating around that can point you in the ergonomically correct direction, but in order to make things easier, here is a quick checklist based off some of those readings. The sources are linked to at the end of the post, for those of you that feel so inclined. Feet should be flat on the floor, ankles at 90 degrees. Thighs parallel with floor and knees bent 90 degrees. A few inches of space between the back of your knees and the edge of the chair. Elbows at 90 degrees when using keyboard. 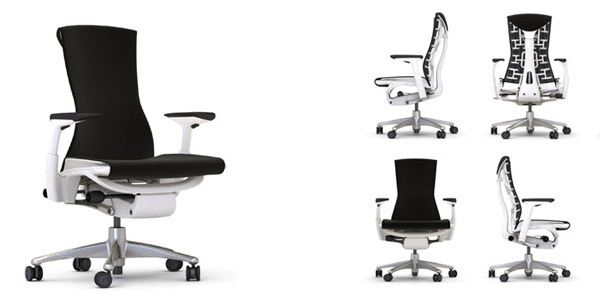 Sit back as far as possible within the chair, it will force upright posture. Your armrests should act as an extension of your desk (elbow height = desk height). Keep the most used items within reach on your desk, minimizing reaching up or down. Give your monitor some personal space, put it 20″ to 30″ away from your face (an arm’s length). If your monitor allows tilting, aim for a 10 to 20 degree angle, which will help minimize neck movement. Center your monitor in front of you, to avoid unnatural neck/body twisting. Keep your head in a neutral position, so only your eyes have to move to see the screen, not your neck. 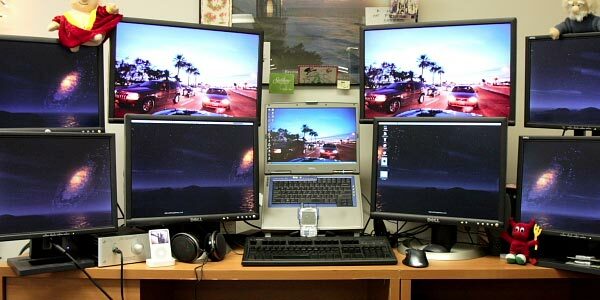 Your direct line of sight should be closer to the top of the monitor, to avoid bending your neck upwards. Relax your hand(s) and fingers. Arm holding mouse should be at a 90 degree angle, allowing for full arm movement. There have been mixed reviews about soft wrist rests (like those gel pads), although studies from University of Berkeley, California noted that they can cause unnatural angling of the wrist and can sometimes even pinch blood vessels. Stretching – If you have four minutes and a desire for your coworkers to look at you funny, you might want to consider stretching before beginning your work day. Workspace Planner – Punch in your height and get exact measurements to help you set up your workspace. 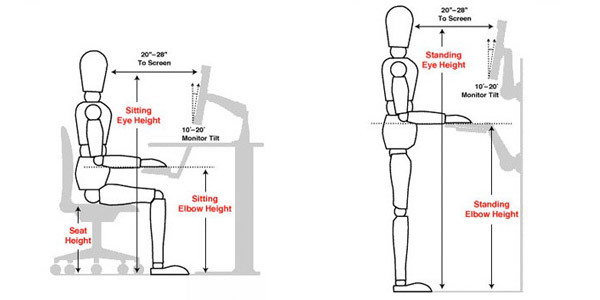 Cornell Ergo Guide – A comprehensive look at everything ergonomic from Cornell University. Workstation Assessment Checklist – A very thorough checklist to run your workstation through. Comfortable Computing – A whole wealth of ergonomic information. Man, my work area needs some serious improvement! The thing I constantly remember is the keyboard stands thing. Every computer that I use has the stands up, and I always put them down. I get annoyed whenever someone is typing with my keyboard, and they put the stands up. I thought if you bought an Aeron chair it did all this for you? Hehe – just kidding. One important thing to keep in mind when choosing the location for your workstations is this: the monitor should never stand infront of a window. This causes a lot of strain to the eye of constant refocusing objects since you are more likely to look out the window. I don’t really have a source for this but I actually did an assignment a few years back on it. I’ve also heard somewhere that the monitor should be placed so that the sunlight comes straight from the side? Of course not directly on it, that is pretty stupid. But I guess some opaque paper/plastic slapped on the windows would solve that quite easily! Btw, the optimal actual lightbulb light for the monitor is somewhere around 5000K which is the most neutral white light there is. I know that this is mostly for us working with print to get a more accurate colorproofing against testprints to test colors etc. but I thought that web dudes could use that information as well. Dig the post. Definitely something that people don’t think about too much is the desk ergonomics! How about the exercising balls used as sitting chairs in many companies. They are also supposed to be quite ergonomic too. Fantastic post. It’s actually really interesting. This method works best with a basic (not funny shaped) mouse. I hold it kind of sideways (45 degrees may be more exact). My thumb is at the bottom and my ring finger is at the top. You can use these two fingers or you wrist (side to side motion) to move the curser up and down. Everything else is normal. My button fingers still fit perfectly. The benefits are that my hand is almost completly flat (not squished to hold the sides of the mouse) and I can rest my wrist on the table. My hand is average size. My hand has never been sore from holding a mouse like this and I’ve been doing it for years. I’ve never seen anyone else do this and I wanted to pass it along. It may take getting used to, but it works really well. I’ve heard something about the background, that it’s nice to put something black, or just to paint the wall black… I just heard. But why not blue? Nicely done. May I add to it? You are spot on about keeping your wrist straight when typing or mousing but that’s pretty much impossible for most if their keyboard is on their desktop which usually means reaching up (wrist extension), and with a flat keyboard which causes ulnar deviation. Thus most people need a keyboard tray that brings the mouse and keyboard into their lap and most ergonomists will recommend that the keyboard tray be able to tilt downward away from the body. Those who type all day should consider an ergonomic keyboard that prevents ulnar deviation. There’s a number of great mice out there too that prevent wrist twisting, have easy to click buttons and/or other features for specific needs. wow Michael, that’s a great way to hold a mouse. It really makes my hand flat and I feel no strain at all! And I agree with Dennis, you shouldn’t be facing to a window when you work. Great points. Unfortunately, I am constantly failing to do the basic prevention: make 5 min pause at least every hour, if not more often. Maybe you guys should buy one of those chairs and start posting something more interesting? I think the attached photo should speak for itself. wow looks like this upgrade would take me one week lols.. Anyways great post, I just bookmarked it for future use..
Zach’s avatar is hilarious lol. But good blog thanks for sharing it. You can use these two fingers or you wrist (side to side motion) to move the curser up and down. Everything else is normal. My button fingers still fit perfectly. Great article! I have definitely incorporated many of the tips in my workstation. Thanks for sharing! a. they are not height adjustable and odds are that the one you’re considering doesn’t get your arms and legs to where they need to be (see posture images above). b. they are a major safety hazard and clients of ours who let an employee use one require they sign waivers of liability. They can pop or roll away. It is easy to fall off of one. c. they don’t distribute your body weight well and can cause more problems plus for some people having no support for the spine for more than an hour or two can actually cause damage. My article on ball chairs – Are Ergonomic Ball Chairs a Good Choice? Do Make my Workstation more Ergonomic.